This week I knew I had to get some tasks finished including a bit of school work. Monday night we took a guided tour through the east end of London to follow the footsteps of the infamous Jack The Ripper. Meeting at Tower Hill station we headed out about 8 o'clock and snaked our way through the east side, making periodic stops to hear a continuing story about the murders that shook the east end in the fall and winter of 1888. Our tour guide told us every we wanted to know in dark alley stops and next to buildings that Jack the Ripper would have passed by when he made some of the murders that have been made famous in legend and English culture. We learned all of the gory details, saw spots where some of the bodies were discovered and even walked through dark passage ways that Jack would have had to have gone through to escape the locations of his murders. Tuesday, along with Caroline Cox, a fellow RHS XC runner, who is studying in St. Andrews, Scotland I toured the Sherlock Holmes museum and made a delicious version of Sheperd's Pie with lamb meat. Well, I wouldn't say delicious. Wednesday was dictated by the fact that I got my spring break trip flights, and hostels booked. Details are as follows: Friday 15 Feb I fly into Venice, Italy. I am staying for two nights. Sunday morning I am taking a train to Florence, Italy, where I am spending two days of Wine induced Tuscan culture and most importantly, Food. Tuesday, I am taking a train to Rome to spend for three days before I fly back Friday evening. Yesterday, our entire group met upstairs ( I live in the basement) and left via coach at 830 a.m. for Dungeness and Rye in Southeastern England. Arriving in Dungeness first, we took only an hour to walk the beach and the small fishing point on the coast of England. The beach is special for its incredibly rocky beach. The houses litter nearly 1 km inland but are spread out in a rudimentary way. Although the awkward appearance the houses are some of the most desirable on the coast of England. As Lyndon put it, "Londoners queue up to get one." We then traveled to Rye, a famous village nearly 2 km inland from the English channel, in one of the most historic areas of Europe. The village itself is nearly 2000 years old and has been controlled by the Normans, Saxons and several other groups through time. We walked around and then ate at the Fish Shop to have, yes again, Fish N' Chips. This time however the English staple was served with mushy peas. 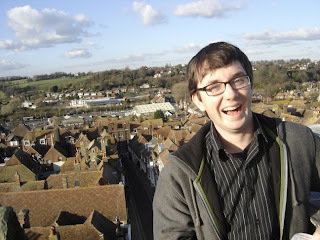 The highlight of the day came when climbing the St. Mary's Church tower to get a view of Rye outward to the channel. Following the climb and descent on the archaic steps and hallways, I had a traditional tea at Cobble's Tea Room. This weekend, I am traveling to Wales to journey through the city of Cardiff. I will give updates as I am taking my computer with me to the Nomad Hostel.